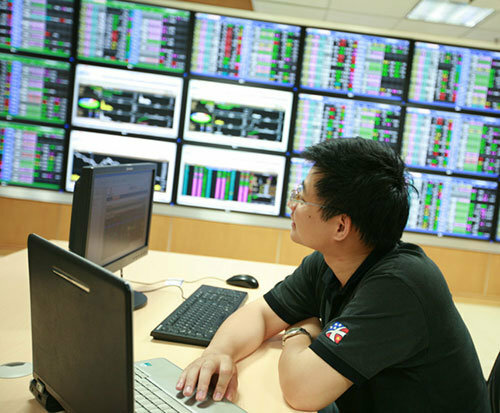 With nearly 193 million shares traded, total trading value reached more than VND3.7 trillion ($176 million). HA NOI (VNS) — Profit booking intensified during yesterday's trading, dragging shares on the HCM City Exchange down. However, shares on Ha Noi Exchange managed to close slightly up. Yet the capital inflow into the stock market remained at a high level, topping at VND5.3 trillion (US$252.38 million), 15 per cent higher than Wednesday's total. The VN-Index slid 0.88 per cent to end the day at 600.26 points and needs to increasingly consolidate at the 600-point level during future trading sessions. The benchmark index was on a decreasing trend from 10a.m. during the morning trading, as selling pressure intensified as the value of many stocks increased due to investors' expectations. Meanwhile, on the southern bourse yesterday, losers overwhelmed gainers by 145-92. Among blue chips, the red colour spread across the billboard with two-thirds of the VN30-package, or the southern bourse's 30 largest stocks by capitalisation and liquidity, closing lower. The VN30-Index lost 5.86 points, or as much as 0.86 per cent, to close at 676.08 points due to drops from big names such as Bao Viet Group (BVH), Hoa Phat Group (HPG), PetroVietnam Drilling Corporation (PVD), PetroVietnam Transportation Corporation (PVT), FPT Group (FPT), PetroVietnam Low Pressure Gas Distribution, Vingroup (VIC) and Vietcombank (VCB). Masan Group (MSN), after increasing to its ceiling price on Monday as the Market Vector Viet Nam ETF increased its holding of MSN during the fund's review of its investment list last week, slid 2.8 per cent to close at VND105,000 ($5) per share. Vinamilk (VNM) also lost VND3,000 (1.5 cents) per share yesterday. Only seven blue chips managed to gain yesterday, including Hoang Anh Gia Lai (HAG) and Tan Tao Group (ITA) thanks to the buying of foreign investors. Profit-booking also occurred on the Ha Noi Exchange, however, the benchmark index ended slightly during the final trading minutes. The HNX-Index edged up 0.03 per cent to land at 89.7 points, while the HNXFF-Index, tracking stocks with a minimum free-float rate of 5 per cent, added 0.33 per cent, or 0.36 per cent to 90.71 points. Composed of top stocks, the HNX30-Index gained 0.11 per cent to reach 184.17 points. The trading value reached VND1.5 trillion ($71.4 million) on the exchange of 138 million shares. Sai Gon – Ha Noi Bank (SHB) continued to lead the bourse by capitalization, with more than 18.8 million shares traded, following a record trading volume of 31.4 million shares on Wednesday. SHB finished up 4.5 per cent at VND11,600 (5.5 cents) per share. Also, foreign investors continued to be net sellers yesterday with a net volume of 7 billion shares and a net value of VND174 billion ($8.28 million), respectively, 34 per cent lower but 46.47 per cent higher than Wednesday. According to FPT Securities, the net selling of foreign investors hit the recovery of the benchmark indices. However, with significant capital inflow, the market trend remains positive in the short term, according to FPT Securities.